Attractive: Striking design to enhance your home, school, office, local park or swimming pool. Cool Comfort: Added bonus, cool the interior of the home, office or school room as well as shading & cooling an outdoor area. Easy Protection: Protect family & friends from the sun's harmful rays that cause skin cancer. Save your expensive home furnishings from fading. Versatile: Custom design to suit any architecture or landscape. Safe: Engineered to individual requirements. 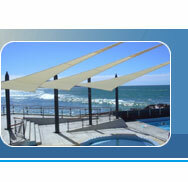 Practical: Shade large or small areas with single or multiple Shade Sails. Simple adjustment for changing sun angles. Ideally, you should plan to order your Shade Sail® in the months prior to summer, so that it can be supplied and installed ready for those days of hot sunshine. © 2006 Shade Sails - All Rights Reserved. Shade Sails & SunSafe are registered trademarks of Fyfe Sails Ltd.